We scan your photos directly from the film strip, mounted slide or film roll with high-class Nikon film scanners in best quality. Do you have photos on film strips, mounted slides, APS film rolls or even medium or large format films, which you would like to have digitized in order to watch them on the screen, burn them as a slide show on DVD, print them out or order prints in poster format? We transfer your analog photos into high resolution digital pictures. In order to to this we use professional Nikon film scanners, which cost a five-digit Euro amount with all the necessary accessories. Normally we digitize 35mm slides or negatives (mounted, on strip or roll) with a resolution of 2.800 dpi, resulting in approx. 3.900 x 2.600 pixels, i.e. 10 million pixels. The resolution of 10 megapixels beats most digital cameras and is enough for high quality prints up to 30 x 20 cm. However, our Nikon film scanners can even do more: A scan of a 35mm positive or negative with the maximum resolution of 4.000 dpi provides 20 million pixels, which makes high quality prints up to 40 x 30 cm possible. A medium format scan with 4000 dpi resolution creates files with unimaginable 80 megapixels (6x6) or 120 megpixels (6x9), respectively. Since our Nikon film scanners have a density range of more than 4, smallest color nuances are differentiable, especially in shadowed areas of the picture. 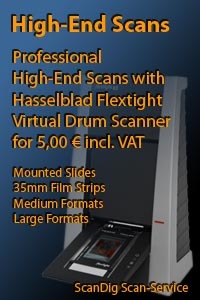 And that�s where high quality film scanners distinguish themselves from low cost models. We store the scans on DVD, USB stick or an external USB hard drive, either in a low-compressed JPG format or in the uncompressed TIF format. Optionally we scan your photos with a color depth of 48 bit instead of 24 bit. Using a color depth of 48 bit the number of tones per color channel (red, green, blue) increases from 256 to 65.536. The total number of possible colors increases thereby from about 17 millions to unconceivable 281 billions. Optionally we store the scans in the SilverFast HDR format. This means, that you get raw data from the scanner which you can process with the software SilverFast HDR. Since you get the raw data from the scanner it is like digitizing your films yourself, since we perform the digitalization with the scanner and you do the real scanner data processing on your own. For scans of color films we utilize the hardware based automated scratch and dust removal ICE, if technically possible. By an additional infrared scan dust, scratches, creases and finger prints are detected and corrected automatically without losing any details of the original picture. If you have very old faded films we optionally make an automated color restauration ROC, which brings your old photos back to life. Optionally we offer you a standard or professional image editing for your scans. If you choose that option, all scans will be edited and optimized in Photoshop® by an image editing professional, so that you'll receive perfect digital images. We digitise your video tapes and film rolls with professional studio equipment in top quality at economy-price! Do you still own video tapes or even nostalgic film rolls with partly precious private contents like for example the long ago wedding, your children's first attempts at walking, baptism, communion or the first holidays together? Or video tapes in a company with a long ago company anniversary, an outstandingly funny christmas party or long ago tradeshows, presentations or exhibitions? Before your precious videos and films go to seed and fall into oblivion we bring it into digital form and thus protect it against wearing and obsolescence. With our professional video and film equipment we make DVDs or digital video files of your analog video or film material. Due to state-of-the-art noise reduction and correction methods we can even achieve better image and sound quality than the original. What can be digitized with our film scanners? Mounted slides: The mounts may be made of glas or plastics; the width of the mounts may vary between 0.8 and 3.2 mm. Normally there are positives in the mounts; however, there is nothing to be said against it, if you put negatives in mounts. Important is, that positives and negatives are not mixed up. Kodachrome slides: We scan Kodachrome slides with the Nikon 9000 - the only film scanner providing the ICE professional scratch and dust removal for Kodachromes. 35mm film strips: We digitize 35mm film strips (positives or negatives) up to a length of 6 frames. The film strips will always be scanned completely; the selection of particular pictures on a film strip is not possible. 35mm film rolls: We scan complete 35mm film rolls (positives or negatives) up to a length of 40 frames. The film rolls will always be scanned completely; the selection of particular pictures on a film roll is not possible. APS film rolls: Complete APS film rolls can be scanned up to a length of 40 pictures (positives or negatives). The film roll will always be scanned completely; the selection of particular pictures on a film roll is not possible. Medium format films: The positives or negatives may have the size 6x4.5, 6x6, 6x7, 6x8 or 6x9 cm. We process both singular pictures and mounted slides and film strips up to a length of 20cm. Film strips will always be scanned completely. Large format films: We digitize large format films up to a size of 31 x 42 cm. Panorama films: We scan 35mm panorama films up to a size of 24 x 66 mm. We process only singular pictures, both positives and negatives, colour and black/white exposures are allowed. Film strips have to be cut in singular frames. 35mm roll films: We digitize 35mm roll films without perforation of arbitrary length. Such roll films may contain hundreds or thousands of singular pictures. Minox-films: Pictures of the size 8x11mm on Minox films will be scanned with the professional Nikon 9000 film scanner picture by picture. 16 mm films: We scan 16 mm films with a special film holder with the Nikon Super CoolScan 9000 film scanner. 24x24 films: We digitize films in the quadratic 24x24 format on 35mm films with self constructed film holders. Instamtic films: We scan instamatic film strips with 28x28mm frames with the help of self constructed film holders. X-Rays: We digitize x-rays up to a size of 31x42 cm using a special scan software for x-rays. Glass plates: We digitize glass plates with a maximal thickness of 5 mm up to a size of 31x42 cm. Black/white exposures: We scan both color and black-white pictures. Important is that you separate color films and black-white films and that you fill out two different scan order forms, since the scanning procedure is completely different for black and white films. In principle we digitize each kind of film up to a size of 31 x 42 cm, even fractions of film, cut films or individual formats. For non-standard film formats we ask you for a description of your film material in advance so that we can provide you with an individuel price for your film material. Which videos can be digitised? The prices for our scanning-service you find in our detailed price list for scanning mounted slides, negatives or photos. On that price list you also find details to the specific film formats. Our prices for video-digitalization and film rolls digitalization you find on a separate price list for videos and film rolls. Since the set-up and finishing of a digitalization order takes a considerable amount of time there are minimum order quantities for all film sorts, which you can find in our price lists. We are available for you throughout the whole year, so you may send us your films at any time. If you have questions to our scan service, please, don't hesitate to contact us. You reach us via e-mail 7 days per week. Please, pack your film material in a parcel box or simply in a big cushioned envelope and send it to us with a filled out scan order form. Please, send us only the pictures to be scanned, i.e. no photo collections from which only a couple of marked pictures are to be digitized. We scan and bill all the pictures sent to us. Of course we use your original package for the return shipment of your film material after scanning. Of course you may bring your film material to us personally during our business hours. 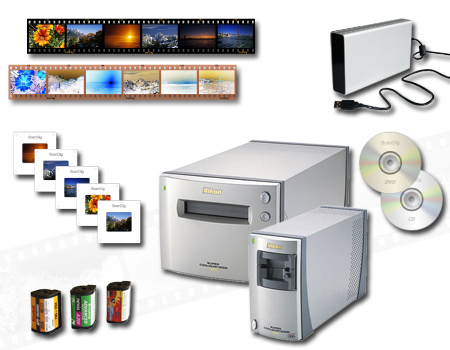 After receipt of your parcel we digitize your films with our scanners (Nikon, Hasselblad, Epson, Canon). The scans are numbered continuously, e.g. Image001.jpg, Image002.jpg, Image003.jpg... For each slide magazine or each evelope with film strips we create a specific folder on the DVD/USB stick/USB hard drive. Please, choose on the scan order form, which resolution and which image format (JPG, TIF, TIF48) you desire. Your video material will be digitized with professional film equipment according to your options on the video order form. Your videos will be numbered continuously, e.g. film01.mpg, film02.mpg, film03.mpg... Alternatively, you can also give us a list with individual film titles. After scanning your films the files are burned on DVDs, respectively, or stored on an USB stick or external hard drive. Usually you'll receive your DVDs or USB stick/USB hard drive within one week after receipt of your parcel. Together with the data medium you also receive a detailed invoice with separately declared VAT. If you have an international VAT-ID (only EC countries), we send you an invoice without VAT. Please, contact us in before if your scan order ist time critical. After payment of your invoice we send back your film material in an insured parcel and delete the scan files irrevocably from our hard drive. Then we would appreciate it, if you recommend us to your friends or business partners or if you commit your films to us one day again. Please, check and make a backup of your scans/videos after receiving your DVDs/USB sticks/USB hard drives, e.g. by copying the files on your computer or on an external hard drive. If you live in a country outside the European Community, please, contact us before you send us your film material. We have served more than than 2000 custumers since the year 2000. The variety of photos we have scanned so far comprises nearly everything from long exposured astro scenes over wonderful holiday photos to a group of a hundred dentures made by a dentist in the course of his professional life. Accordingly our clientele is very various. On our website references there are listed both professional photographers, companies and image agencies collaborating with us and private citizens, who commited us with their films and who present their photos on particularly sensational web sites. You can read more about us, our service, our experience and our advantages on our website about us. This site has been translated from German into English and serves for a better understanding for the English speaking visitors of our website. By differences the content of the German original website holds. Changes on the original German site after the translation will not be maintained automatically on the English site.